The HEROSCAPE events are now online at the Gencon Website including the MAIN EVENT!!! For those of you who don't know Gencon is the largest gaming convention in the country and is held in Indianapolis, Indiana. Over 85,000 people attend it every year. This year it will be held from August 2nd - August 5th. We have 20 events available at Gencon this year including several 'Learn to Play Events'. Prizes for the events include the much coveted Heroscape Custom Dice made by our own supporters. Here is an example of dice from previous years. Sign up today and support HEROSCAPE!!! Greetings from the Codex, and welcome to all our readers. Back in August, we announced that we would be releasing monthly “front page promotions.” Obviously, that didn’t happen. However, there is some very important news which we felt warranted another stab at a front page announcement. The ’Scaper of the Month featuring Grungebob, and our first SotM (for the new Codex) featuring an admin. We were excited to bring you this article; be sure to give it a look. An excellent article on the role start zones play in map creation, from ARV head Sir Heroscape. This article has a lot of great tips in it if you’re looking to build a map. All right, it’s that time again! Get your VirtualScape warmed up and running, 'cause we’ve already got another contest underway: VALHALLAN WASTELANDS! We’re really excited about this contest; it will be the 4th one we’ve run, and all the others have had impressive involvement from the community. Head on over to the ARV Contest Thread for details on the map building contest, 'cause you won’t wanna miss out on the prize that will go to the winner! Submissions are being accepted until October 18th, so just under 3 weeks to get that map worked on and submitted. We look forward to seeing what you’ve got in store! 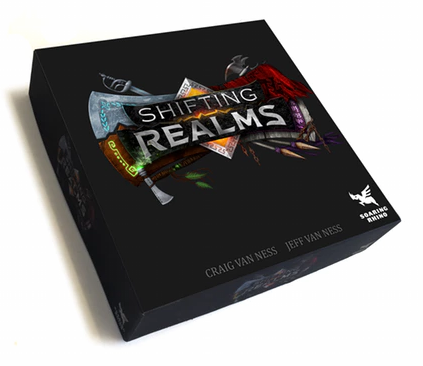 Heroscape lead designer, Craig Van Ness' new game, Shifting Realms, just launched on Kickstarter. It is the first game from his new company, now that he's designing independent of Hasbro. I just backed the game and if you buy a copy too, PM me (@Xorlof), and we'll set you up with a year of site supporter status here at Heroscapers (or extend your status if you already are a site supporter). So have a look at the Kickstarter page, and if you like what you see, show some support for Father Heroscape!